ElcomSoft Distributed Password Recovery | Elcomsoft Co.Ltd. Break complex passwords, recover strong encryption keys and unlock documents in a production environment. Supports: all versions of Microsoft Office, OpenOffice, ZIP/7zip/RAR/RAR5, PDF, BitLocker/PGP/TrueCrypt. Over 300 formats supported. Break complex passwords, recover strong encryption keys and unlock documents in a production environment. Elcomsoft Distributed Password Recovery is a high-end solution for forensic and government agencies, data recovery and password recovery services and corporate users with multiple networked workstations connected over a LAN or the Internet. Featuring unique acceleration technologies and providing linear scalability with no overhead, Elcomsoft Distributed Password Recovery offers the fastest password recovery by a huge margin, and is the most technologically advanced password recovery product currently available. Size does matter. Advantages of distributed password recovery. Unlike competition, Elcomsoft Distributed Password Recovery is not ‘virtually’ or ‘practically’ linear in scalability. By doubling the number of PCs working on a password, you cut the time required to recover a password by half. By only transferring the bare minimum of information over the network, Elcomsoft Distributed Password Recovery allows for massively parallel operation, and scales linearly to as many as 10,000 workstations with no scalability overhead. 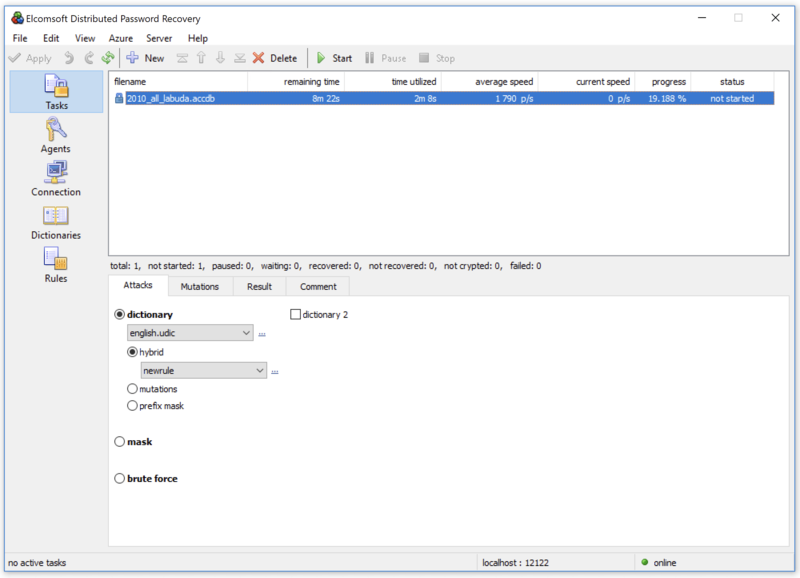 Elcomsoft Distributed Password Recovery enables distributed work over the LAN, Internet, or both. Minimum bandwidth requirements ensure no scalability overhead even for the slowest connections. 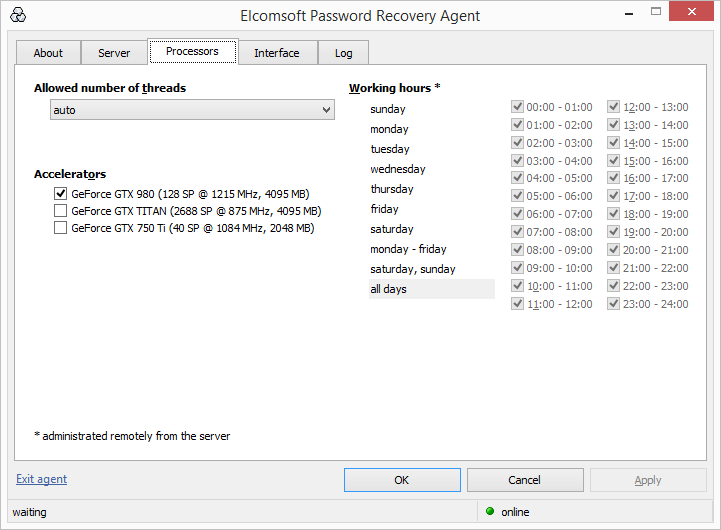 The convenient management console allows controlling Elcomsoft Distributed Password Recovery from any networked PC. Users can quickly deliver additional computing power on demand by utilizing Amazon’s GPU-accelerating EC2 Compute Units. Depending on performance requirements and budget constraints, Amazon EC2 instances can quickly scale to speed up the job, and can be scaled back when not in use. Elcomsoft Distributed Password Recovery running in an Amazon cloud is a perfect solution when additional computational power is needed without the need to invest into building permanent infrastructure in-house. With Elcomsoft Distributed Password Recovery supporting cloud compute instances, users can get as much speed as they need the moment they need. Support for additional cloud services is coming soon. Using brute force attack to recover passwords, it is possible, though time-consuming, to recover passwords from popular applications with the power of the computer’s main CPU. However, the computational power of a general purpose CPU is no longer sufficient to break into many types of data protected with modern encryption methods. Manufacturers utilize tens of thousands of iterations to intentionally slow down the recovery, making the job effectively impossible for all but the simplest passwords. Elcomsoft Distributed Password Recovery utilizes dedicated high-performance cores found in today's video cards such as those manufactured by NVIDIA and AMD to offload parts of computational-intensive calculations onto the highly scalable video cards. Featuring several hundred GPU cores, a single video card can deliver the speed far exceeding the metrics of a high-end CPU. Elcomsoft Distributed Password Recovery uses thoroughly optimized algorithms, reaching recovery rates that are up to 250 times faster compared to CPU-only benchmarks. Today's PC motherboards support multiple video cards. Thanks to ElcomSoft's proprietary heterogeneous computing, Elcomsoft Distributed Password Recovery supports a mix of up to 32 video cards even if they are of different makes and models, allowing for even faster password recovery applications for a modest increase in hardware costs. The tool allows mixing NVIDIA and AMD boards of different generations in a single PC. For more details, see GPU Acceleration Frequently Asked Questions. Elcomsoft Distributed Password Recovery is licensed based on the number of instances (agents). We accept all major credit cards, checks, bank transfers and purchase orders. Sales taxes may be added to your order according to your jurisdiction. Credit card orders are processed immediately. Electronic licenses are generally available instantly after the credit card charge is approved. On rare occasions where we must manually verify your order, the license will be available in 48 hours or less. Elcomsoft Distributed Password Recovery supports a variety of applications and file formats, allowing password recovery from Office documents, Adobe PDF files, PGP disks and archives, personal security certificates and exchange keys, MD5 hashes and Oracle passwords, Windows and UNIX login passwords. Important note: hardware acceleration (for specific file formats and algorithms only, see the above chart for details) works properly only on Windows Server 2003/2008/2012 and Windows 7/8/8.1/10 (32-bit or 64-bit); specific versions of NVIDIA/AMD drivers are required; some other restrictions apply (e.g. for some file formats, it is implemented for brute-force attack only, while dictionary attack only works on the CPU, regardless the settings). AES-NI and AVX2 are the new instruction set available in some modern CPUs. 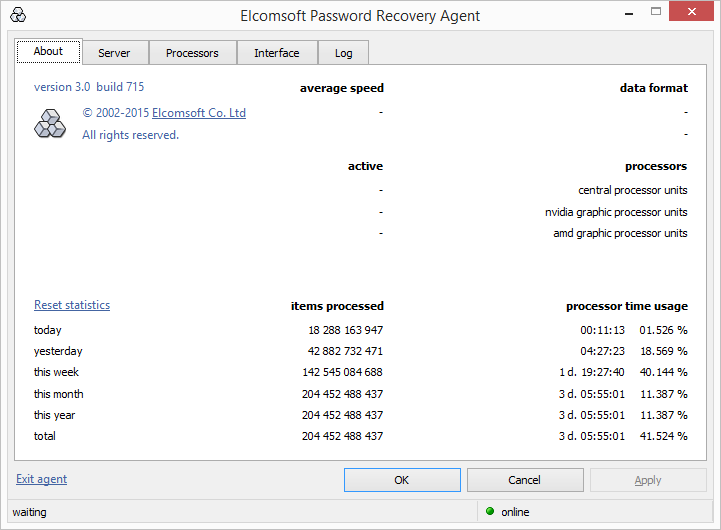 Elcomsoft Distributed Password Recovery supports a variety of applications and file formats, allowing password recovery from Office documents, Adobe PDF files, PGP disks and archives, personal security certificates and exchange keys, MD5 hashes and Oracle passwords, Windows and UNIX login passwords and much more. Works with up to 5 agents simultaneously. When/if the password is found, only first two characters of passwords are being shown, and the other one a hidden under the asterisks.